Latest news for this page is I have built a new Windows ME OS in my computer and I have not set up the studio camera software in it yet. 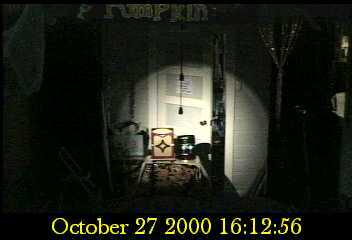 I don't know when I will but I expect to have it in here and working before next "Happy Pumpkin Day" in Oct. 2001. All the news below and picture is old stuff. Other new news is we are building a brand new high tech family website that you may enjoy right now. Most Active On Weekends when we are shooting or working in the studio. You have to hit the refresh to see the updated picture when we are on line. Also check the date of the last picture to see how new it is. If it is recent, like in the last 60 min or so we may be live on line. I have some software working now and when we are on line live the picture will normally update once every 1-2 min. Check the date and time on the picture for info. Remember this is C.S.T. Also I have discovered that Microsoft IE 5.0 or later or AOL 5.0 or later is the best to view this page with. The girls are practicing now for Happy Pumpkin Day Fest 2000 and the camera will be on line on weekends usually from around 10am until about 6pm as long as they are out there working. Enjoy. are getting ready for the deal. Click Here to see animated GIF of spaceship set. When we are on line in the studio here this picture is normally updated once every 5 min.. If you have problems viewing the picture try this HELP!